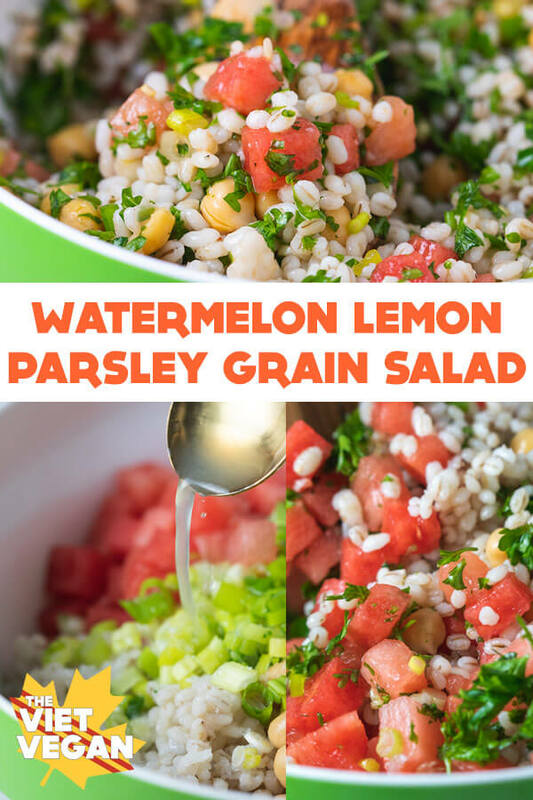 Disclaimer: This recipe is sponsored by the National Watermelon Promotion Board. Well it has certainly been a while since I’ve shared a recipe with you folks, but don’t worry, I’ve been dabbling here and there with the recipe experimentation and I’m happy to report that my latest obsession with cold grain salads has been fruitful (both figuratively and literally). 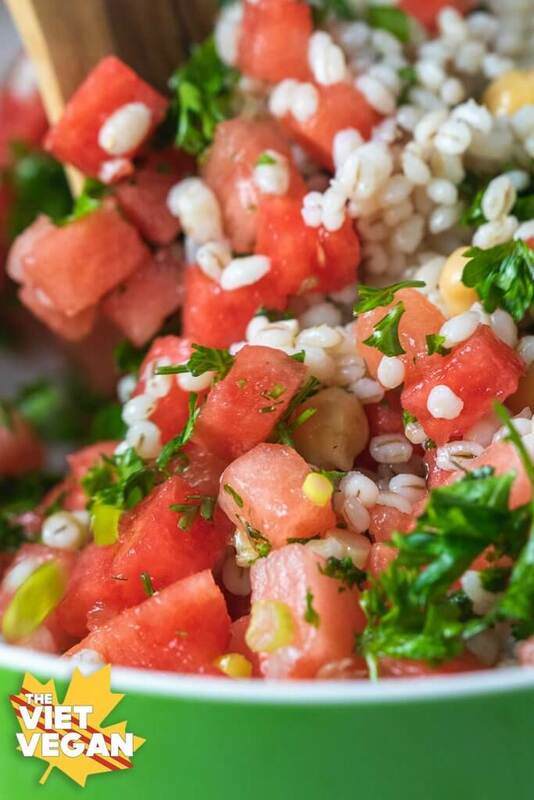 This is my rendition of my latest grain salad: watermelon lemon parsley grain salad (or more specifically, pearl barley). 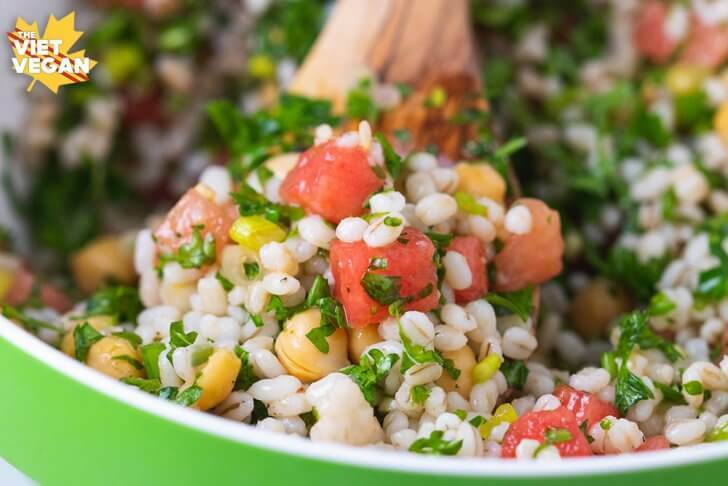 You can certainly experiment with different ingredients as you see fit: switch out parsley for cilantro, or maybe dill; swap green onion for red onion, or farro or bulgur wheat instead of the barley. Add in some roasted veggies like onion, bell peppers, or broccoli if you like. What I highly recommend you keeping is the watermelon, not only for it’s lovely lycopene content (which is an antioxidant), but because it adds a wonderful juicy crunch that stays rather crisp even over a couple days, whereas fresh, diced tomatoes, while delicious, tend to soften over time. Eddie can attest that I eat an absurd amount of watermelon. What I tend to do is grab the mini watermelons, cut them in half, score them and then sprinkle some lime juice, salt, and cayenne powder and carve out that juicy, red goodness. I’ve also made these spicy watermelon mocktails that are perfect for summer entertaining, which you can easily booze up if that strikes your fancy. But this summer I’ve been meal prepping something light and simple that satiates me, but has tons of bold, fresh flavour. Parsley can be overpowering for some, but I find the mellow watermelon sweetness and velvety cooked chickpeas helps soften the flavours. Lemon juice brightens everything up and ties it together, especially with a hint of that olive oil. Pearl barley adds that fun, bouncy chew that I love so much about these fresh summer salads. You can add some extra protein by grilling some tofu, tempeh or seitan. Heck, throw on some extra grilled watermelon to go on top. Summer lately has been full of muggy, hot days where I resort to hiding in my basement in the frigid AC. But after a couple weekend hikes, nothing hits the spot quite like some fresh watermelon. I’ve spotted them in those giant bins outside of the grocery stores lately. The bins remind me of when my mom used to delegate the watermelon choosing to me. Little me would stand on my tippy toes and wedge the edge of those cardboard bins under my arms so I could reach for that especially smooth melon hiding beneath all the the imperfect ones. I would slap, tap, and caresse each one until I chose the one I thought was perfect, only to be dishearted later if I didn’t pick a perfect one. Luckily, after working with the Watermelon Board for several years, I learned from the experts themselves how to choose a delicious, sweet, juicy watermelon without the awkward slapping at the grocery store. There are times I want to interrupt that watermelon-slapping lady at the store with these tips, but I’m never quite sure if the unsolicited advice is wanted. Instead I’ll just tell y’all here, on my own little corner of the internet. Like with most fruits and vegetables, you want to look for a watermelon without any bruises or marks. The only mark you want to see is a creamy yellow spot, which tells you that this melon sat in the sun ripening. Most importantly, you want to pick one that is surprisingly heavy for how big it is. The heavier a watermelon is, the more water it has, and thus, the juicier it is! Watermelons are 92% water, so you definitely want a juicy one. I’m happy to say that over the last 5 years, each watermelon that I’ve chosen has been perfectly juicy and ripe. So there you have it. May your watermelons be ever juicy and ripe. Bring the barley and water to a boil, then cover and reduce to a simmer and let cook for about 25 minutes. I tend to add 2 1/2 cups water then check halfway through to see if I need the final 1/2 cup. I usually do, but I stir just to make sure nothing sticks. After the time has elapsed, give the barley another stir, then cover, remove from heat and let stand another 5 minutes. 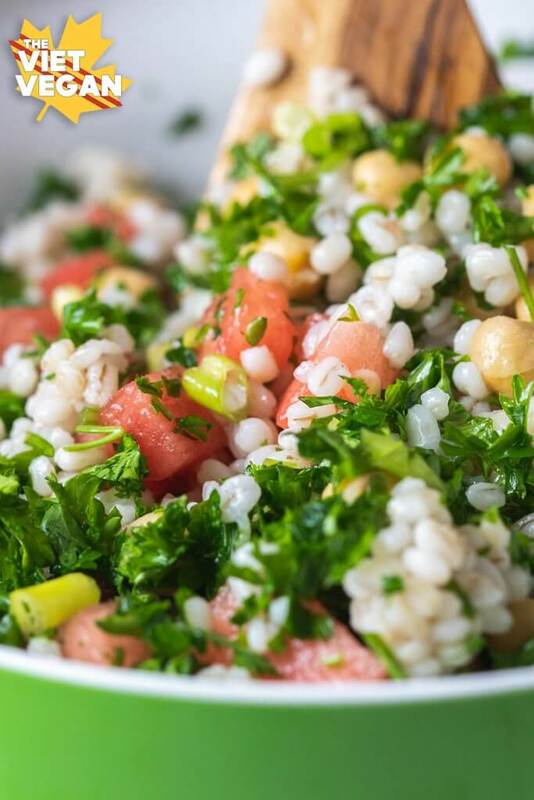 In a large bowl, combine cooled, cooked barley, watermelon, prasley, green onion, and chickpeas. Dress with lemon juice, olive oil, and season with kosher salt, pepper, and hot sauce to your preference.